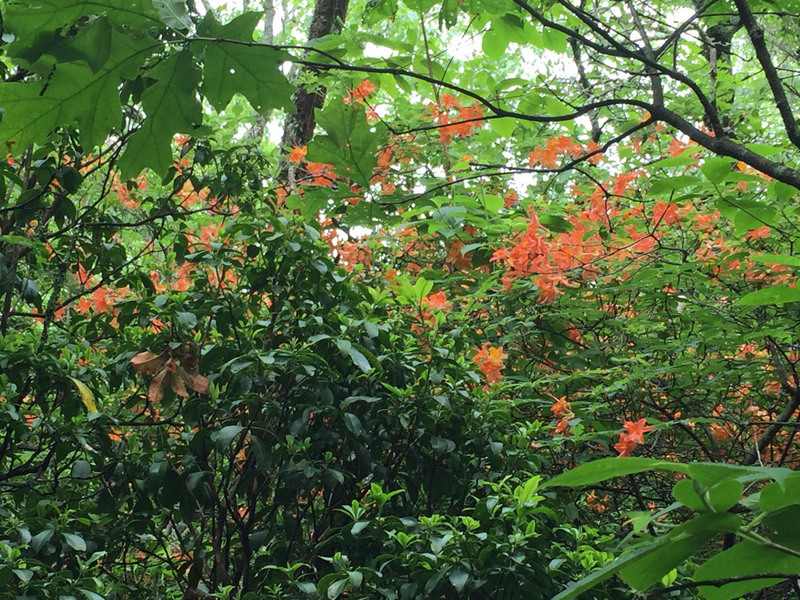 The 2016 William H. Cross Expedition was based in Rabun County, in northeastern Georgia, with most of our collecting being centered in the forested mountain habitat at the Lillian E. Smith Center (LES), Tallulah Gorge State Park, and various localities in the Chattahoochee National Forest. Much thanks goes to Tim Menzel, science coordinator at the LES, biology professor at Piedmont College in Georgia, and Mississippi State alumnus, who set us up at the Lillian E. Smith Center, and to Craig Amason, Director of the LES, for approving our stay at the center. The 150 acre center, located in the mountains of northeastern Georgia, is used as an educational outreach center and an artists retreat. The property is named after Lillian E. Smith, a historic justice activist and author who lived on the property. 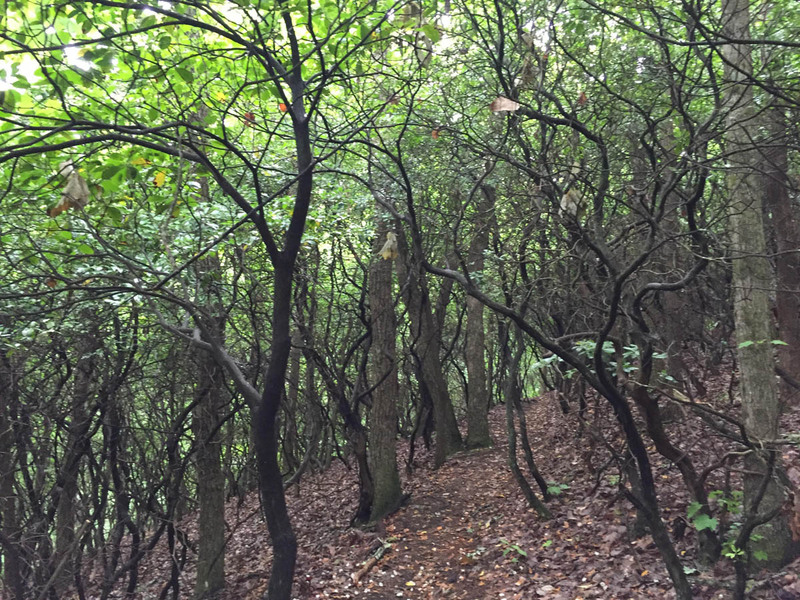 After her death, her family later donated this beautiful mountainous retreat to Piedmont College, which is located about 30 miles away. Accommodations at the LES were perfect for researchers such as our group. With two bunkhouses, each with six bunk beds, we had ample space for everyone during the week. 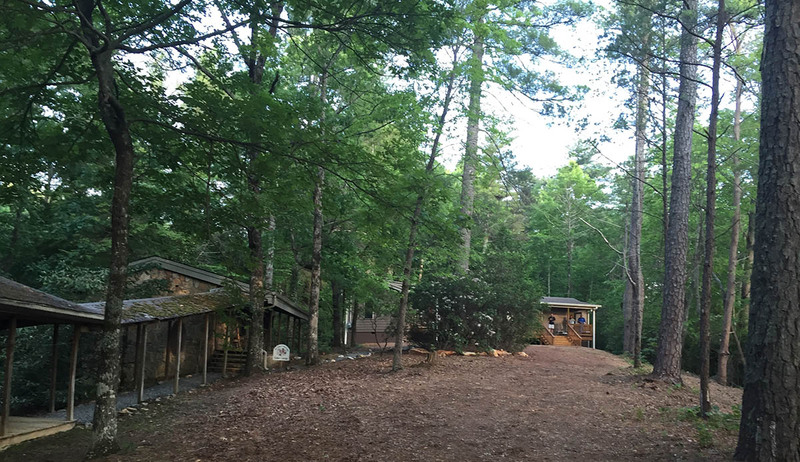 In addition, two other cabins were used by Piedmont College biology students who were doing research with Tim during the same time period. A large "common" building, which housed historic literature and an eclectic blend of artwork was available for us to use as a temporary prep room during the trip. The large kitchen was available for our use as well! Participants of this year's expedition included Richard Brown, Joe MacGown, Terry Schiefer, JoVonn Hill, Ryan Whitehouse, Jordan Gesell, Margarita Baquero, Luis Santiago, Kyhl Austin (MEM Crew, full week); Josh Basham and Nadeer Youssef (Tennessee State University, 3-6 June); Rick Hobecke (expedition leader) and Joe McHugh (University of Georgia, 6-9 June); Tim Menzel and 3 students (Piedmont College); Mecoptera researchers Wes Bicha (TN) and Takeyuki Nakamura (Hirosaki University, Japan, 6-7 June); and Mincy Moffet and Anna Yellin, researchers for the Georgia Department of Natural Resources who lead us to some fascinating localities and also collected specimens with us on 8 June. In general, the habitat at the LES was comprised of beautiful hardwood mountain forests, with a scattering of pines, and with lush fern-rich seepages in the lower sections. 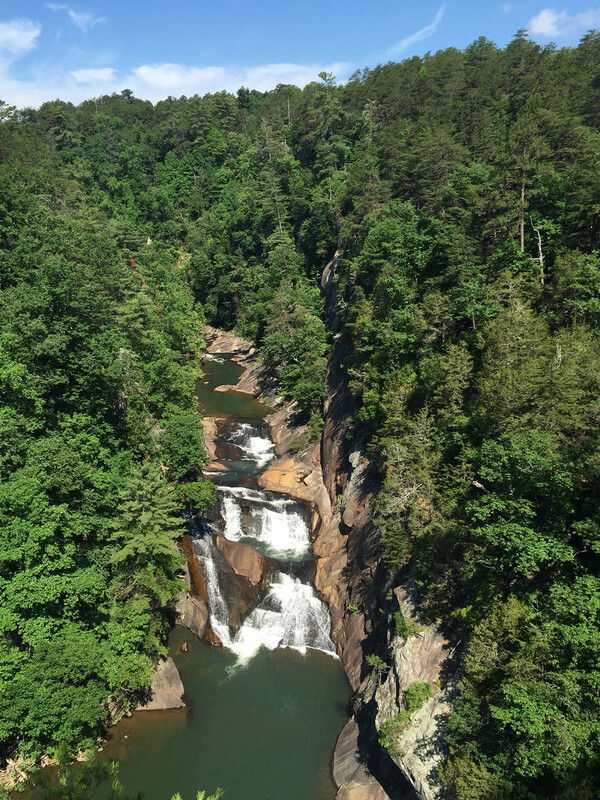 The habitats at Tallulah Gorge State Park and in the Chattahoochee National Forest were similar, but in places with more dramatic scenery. The Gorge at the state park was breath taking, and was filled with visitors from all over the world. 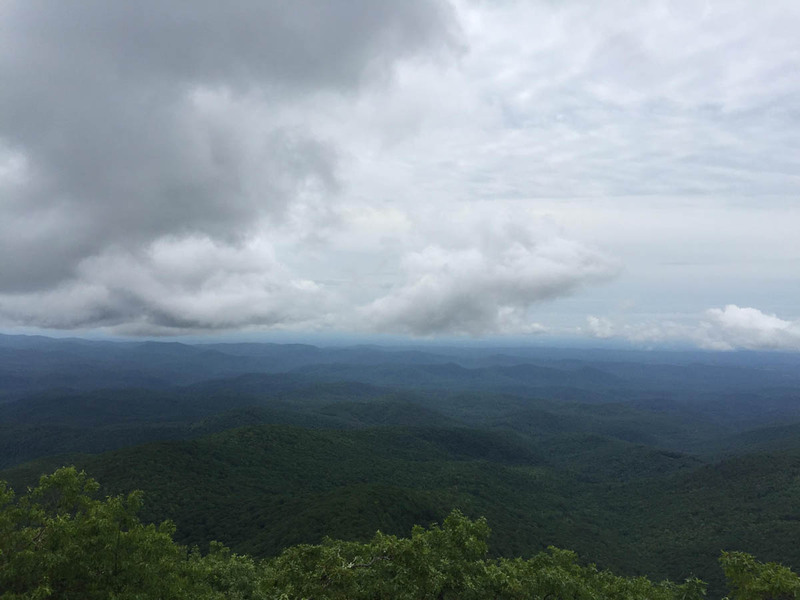 Likewise, Rabun Bald, the second highest point in Georgia, the Chattooga River, Glade Mountain, and numerous other localities within the national forest were simply fantastic. The MEM crew arrived at Lillian E. Smith Center (LES) late Friday afternoon/early evening (MEM crew: Richard, Joe, JoVonn, Terry, Jordan, Margarita, Kyhl, and Luis). Our beetle buddies from Tennessee State University, Josh and Nadeer, arrived mid afternoon and were already collecting. Tim Menzel was there to greet us, and he gave us a quick trip along a trail through the "sanctuary" into a nice boggy mesic area with numerous ferns. Following the scenic tour, several of us got to work collecting, and some folks set up our temporary lab. Terry and Ryan put up a Malaise Trap and a Lindgren funnel trap near cabin area at the edge of a powerline cut at the apex of a steep slope. Judging from the numbers of insects flying into the trap while it was being erected, this was a very good location. 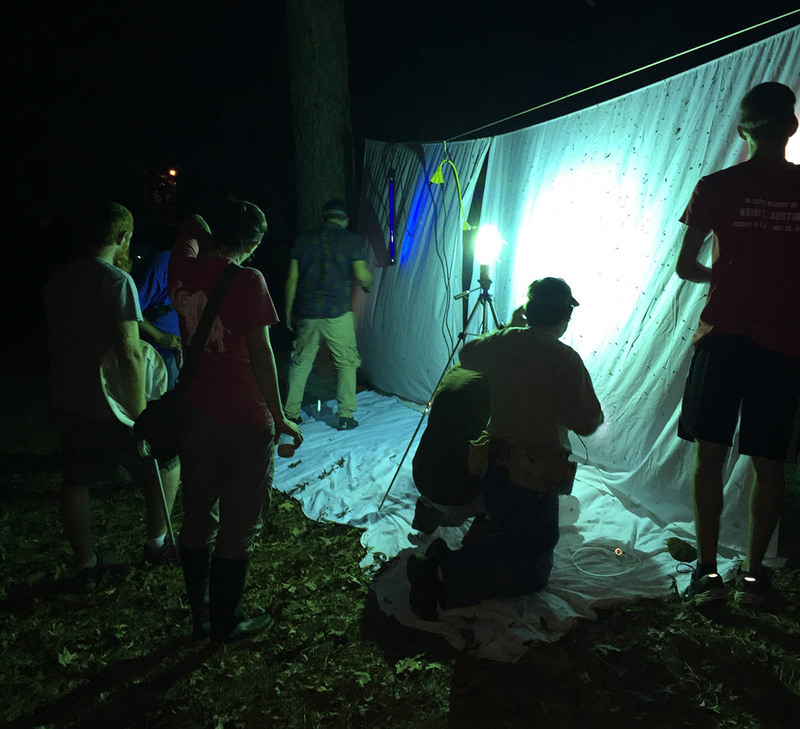 Nadeer and Josh set up a mercury vapor lamp and blacklight with two sheets near cabins, and Richard and the moth crew (Margarita, Luis, and Kyhl) put up two sheets with UV lights in mesic hardwood habitat on the lower trail near the LES library. Richard also put set up a bucket trap with UV light farther down that same trail. While they were setting up sheets, a few of us headed into Clayton to eat supper. We quickly found a Mexican place that provided us with nourishment and energy for our upcoming night collecting. 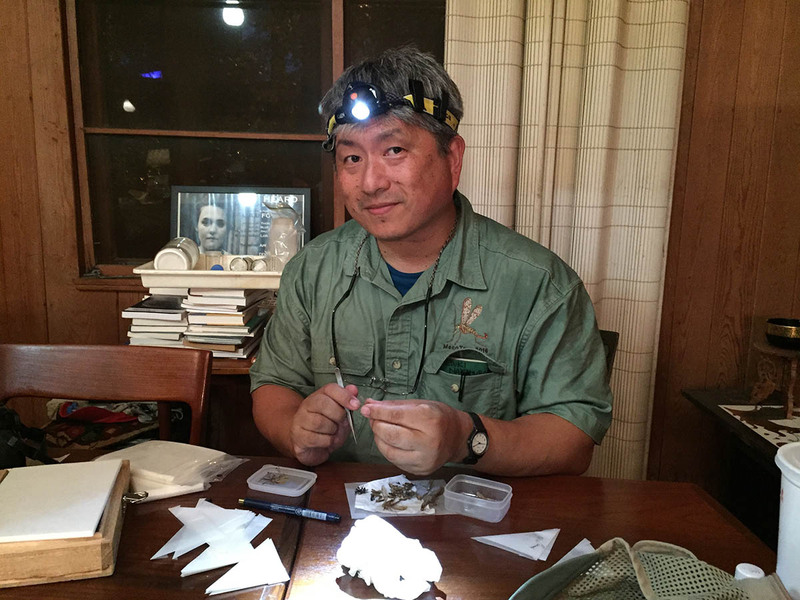 As nightfall approached, we all put our headlights on and meandered back and forth between the sheets collecting various insects with researchers tending to take specimens of their respective study groups. Collecting was decent, but not overwhelmingly great, probably due to the on and off rain. However, we still found plenty of insects to collect that evening. The forecast for the entire weekend was pretty gloomy with high chances of rain. But, we don't let a little rain deter us from collecting. By the time folks pulled themselves out of bed looking for coffee and breakfast, Richard had already retrieved the bucket trap and was sorting moths! 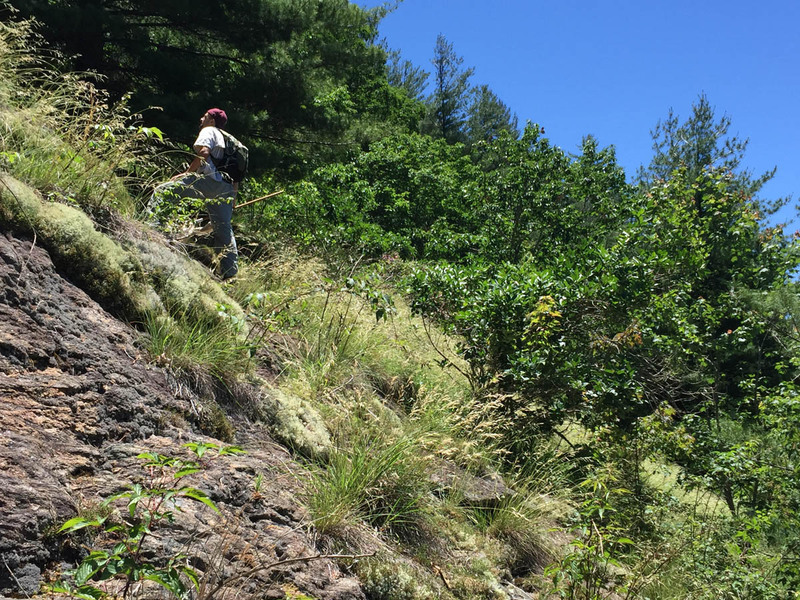 After breakfast, Terry and Jordan put up another Malaise Trap and Lindgren up on the lower trail at the LES, and later in the afternoon, they put up a Malaise trap and a Lindgren funnel trap on an upper trail near ridge top on LES property. Meanwhile, JoVonn, Ryan, Nadeer, Josh, and I (Joe) went to Tallulah Gorge State Park to collect in the morning. We first collected on or near the Upper Rim Trail, which started near the visitor center. The forest here was mostly hardwood, but with a mix of pines. We were limited to trails we could access, due to permits required to enter the "Gorge Trail", but we still had plenty of the nice habitat to collect in. Depending on which way you went on the trail, you could walk about the upper rim area, or access the river at the bottom of the gorge via a series of very steep stairs, a suspended bridge over the gorge, and yet more stairs! Along the route, there were numerous decks with benches for people to rest. These areas proved to be quite useful on the way up! Unfortunately, the stair trail was not a wonderful place to collect. However, the forested areas on the rim were wonderful for litter samples and other collecting. 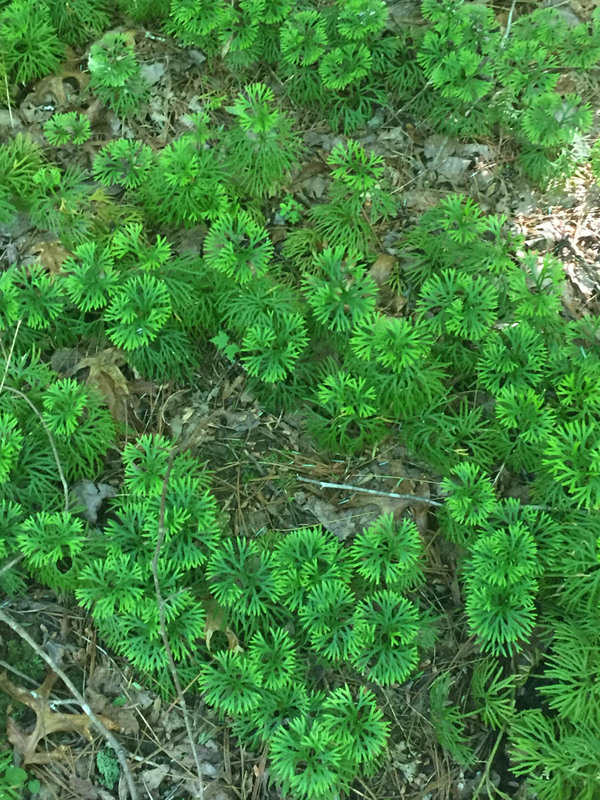 The wooded areas were crisscrossed with seepages with wonderful fern understories. We all collected in this area until about lunch, then we scattered our separate ways. At about 1:00 PM, I headed back to cabin to put on Berlese samples. For the remainder of the afternoon, I collected ants (and other day crawling creatures) in the woods at the LES. JoVonn and Ryan visited another site in Tallulah Gorge State Park, the Stone Place trail. Both of these guys also collect ants, but JoVonn's true love is grasshoppers and Ryan's is weevils. So, they were especially interested in glade-like habitats where they could potentially find particular species of interest. 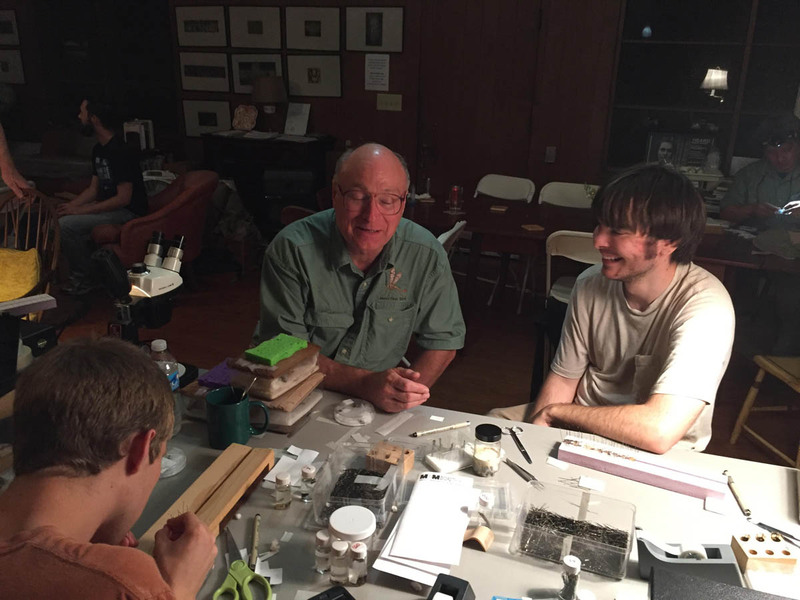 Tim Menzel came by with his three students and a couple of folks from the Audubon society as they were working on a bird/insect ecology project that involved noting the bird species present and running pitfall traps for insects. They all spent the night so they could get back to work early the next morning. Nadeer and Josh, who both primarily study wood boring beetles, left the park to search for buprestids. Despite the fact that buprestids are wood boring beetles, Nadeer and Josh were looking for open areas with dry packed dirt, such as baseball fields, to collect beetles. Why would a buprestid collector look in such a habitat? Well, it turns out that Cerceris fumipennis, a wasp in the family Crabronidae, provisions its burrows exclusively with buprestid beetles. This wasp makes burrows with multiple cells in hard packed soil. After placing beetles into cells, the female wasp lays eggs on the paralyzed beetles, which serve as a food source for the developing wasp larva! This is great for the avid jewel beetle collector, who can easily find communal nests sites of the wasp, because apparently, with so many wasps flying in with prey, a good number of beetles tend to get dropped. If a beetle enthusiast is present, then he or she is then rewarded with the gift of a jewel beetle! To maximize this possibility, researchers can stake down a piece of plastic (or stiff card stock), with a circular hole cut in it slightly smaller than the burrow entrance of the wasp, on the ground with the hole directly lined up above the burrow entrance hole. When the wasps flies in with beetle prey, the beetle is knocked off and can then be collected. 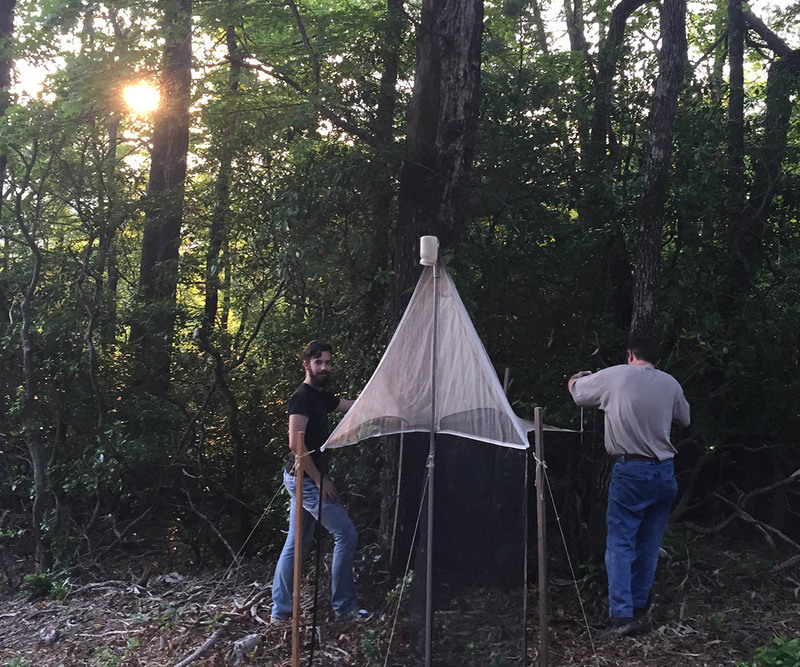 This method has proven to be so effective, that researchers monitoring the spread of the exotic emerald ash borer, Agrilus planipennis (Buprestidae), are now using this technique. For most most of the day, Luis, Richard, Margarita, and Kyhl spread moth wings from the previous nights catch. 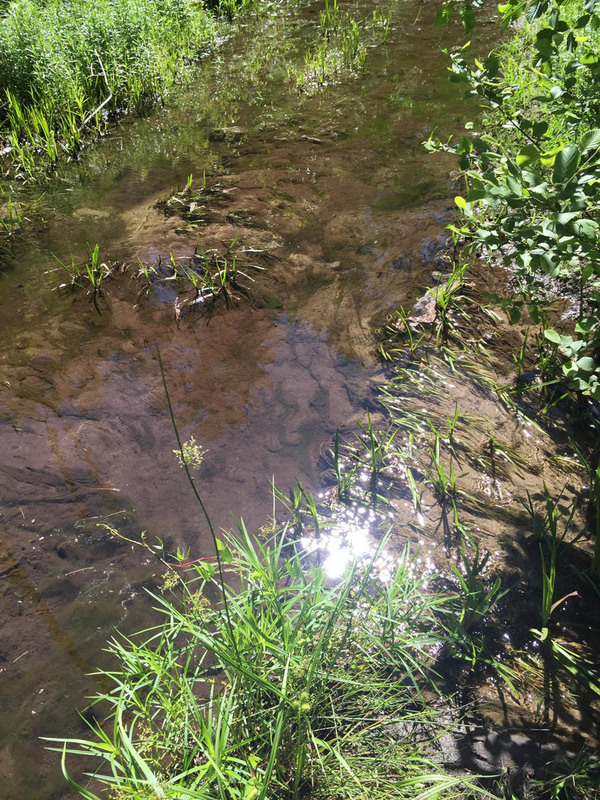 Members of the "moth crew" also went out for collecting forays in the beautiful LES forest where they searched for aquatic insects, ants, and assorted other insects. 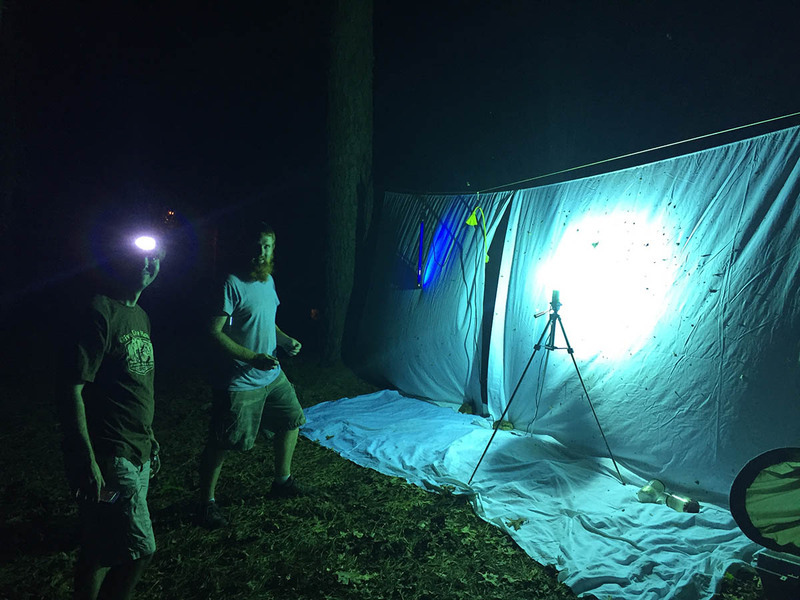 Later that evening, we again put up sheets for night collecting at the LES, with one sheet and UV light behind the common building and two more sheets with UV lights on the lower trail in the mesic forest habitat. Nadeer and Josh's combo sheet setup with blacklight and MV lamp was still up on the top area near the cabins. Additionally, a blacklight/bucket trap was placed on the lower section of the steep powerline cut. With high humidity and occasional rain, the collecting was not spectacular. For much of this Sunday, we had scattered showers and thunderstorms, which dampened our collecting considerably. Early that morning, Richard picked up bucket trap and sorted through it pulling out moths and other interesting insects that had flown in throughout the night. 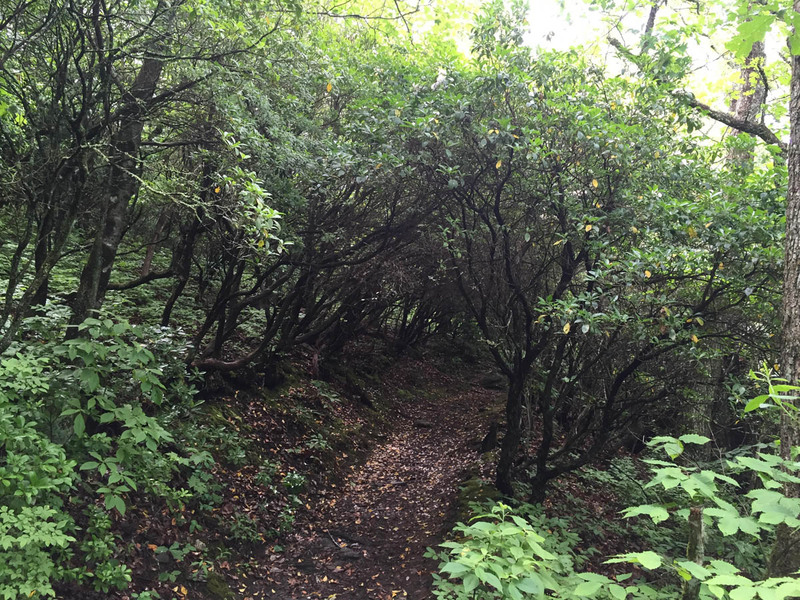 I collected ants and other arthropods on upper trail at the Lillian Smith Sanctuary. 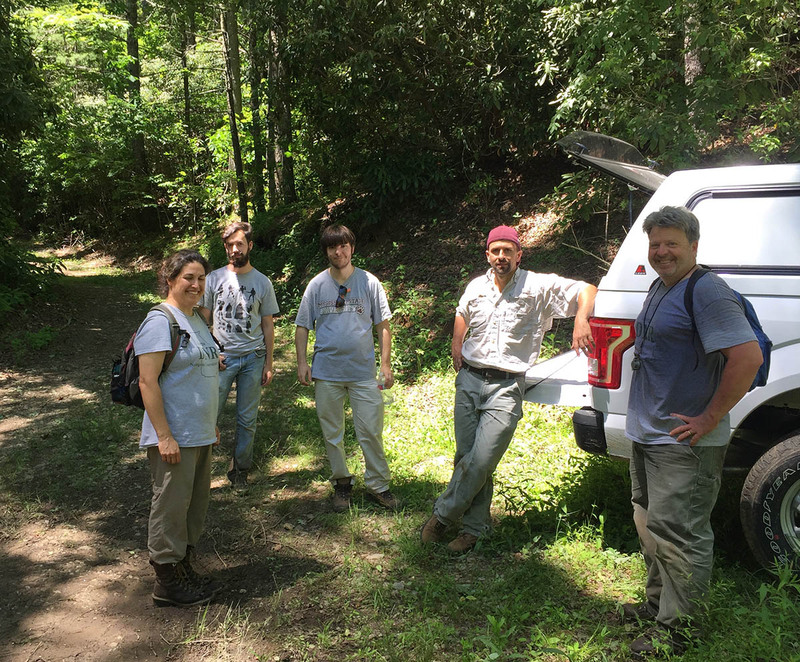 Terry, JoVonn, and Ryan did some exploring and collecting in the Chattahoochee National Forest and at a day use site on the South Rim Trail in the Tallulah Gorge State Park. They found the Currahee Mountain site to be particularly interesting, and made several spots along the way to the top. Richard, Kyhl, Luis, and Margarita again spent much of day pinning moths. Jordan collected at LES during day. After lunch I visited Black Rock State Park, which was located at the top of a mountain reached only by a steep and windy road! Great view, but holy moly! What a road to drive up and down. I later searched for potential blacklighting sites in the Chattahoochee National Forest. Josh and Nadeer spent the day collecting at various sites including a sandy spot on the Chattooga River, which serves as a border between Georgia and South Carolina. 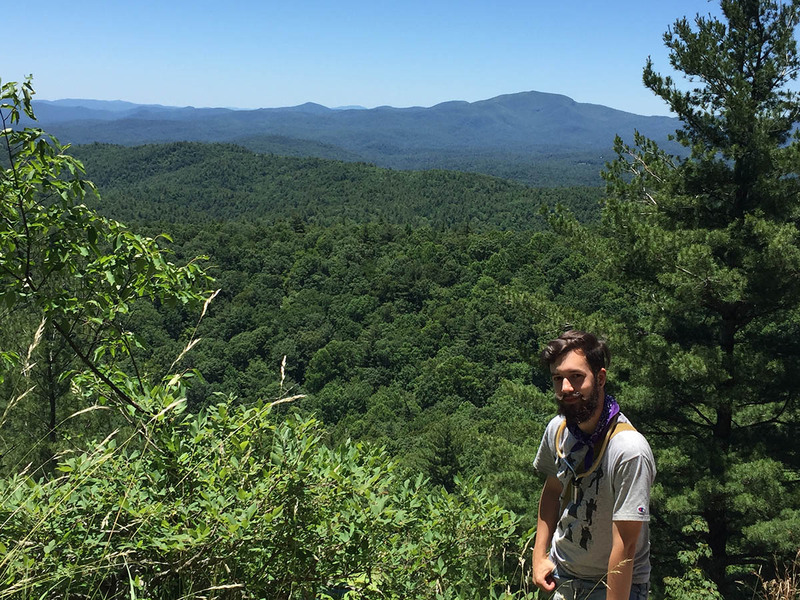 At about 6 pm Richard, Kyle, Margarita, and Luis departed the LES to put up sheets at the Tallulah Gorge St. Pk. Day use site. They also placed a UV light/bucket trap out along a powerline cut at the park. JoVonn, Terry, Ryan, Jordan and I ate supper, then Jordan, Terry and Ryan drove over to black light with the others. Josh, Nadeer, JoVonn, and I stayed at LES and collected at sheet and MV lamp that was set up there. The first of us to arise was again Richard, who was up early to retrieve the bucket trap. He doesn't take any chances with these traps, as they offer treasure troves of interesting moths. JoVonn, Jordan, Ryan, and I left the LES center at about 9 AM and headed to a site in the Chattahoochee National Forest called Rabun Bald. 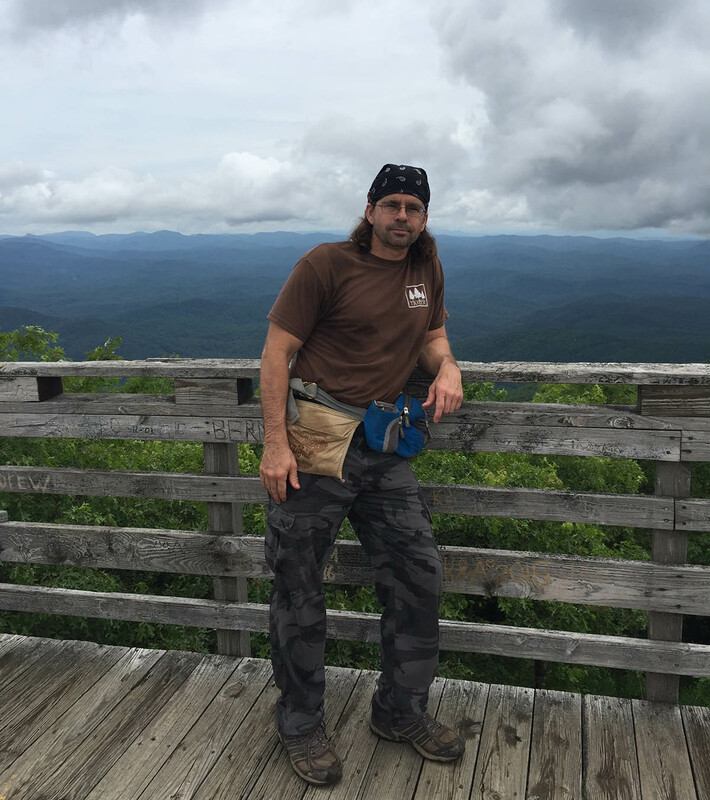 This gorgeous site is the second highest point in Georgia with an elevation of almost 4,700 ft. To reach the bald, we had to hike up a beautiful rocky trail border by rhododendrons, azaleas, mountain laurels, numerous ferns, and myriad other mountain flora. Upon arriving at the bald we were astounded at the high level of insect activity. The area was abuzz with flies, wasps, bees, leaf hoppers, tree hoppers, beetles, and bees. At times, the sound created by the hordes of insects mimicked rainfall. A rock tower, present on the bald, afforded a tremendous panoramic view of the mountainous region. We collected for a couple of hours at this beautiful spot, then returned to the LES arriving there at 3 pm. Terry, and the moth folks stayed at the LES center for the day collecting and pinning. At approximately noon, Nadeer and Josh packed up and drove back to Tennessee. As Nadeer and Josh were leaving, Joe McHugh and Rick Hobecke arrived from the University of Georgia. Both of these guys are Cornell alumni and avid beetle researchers. 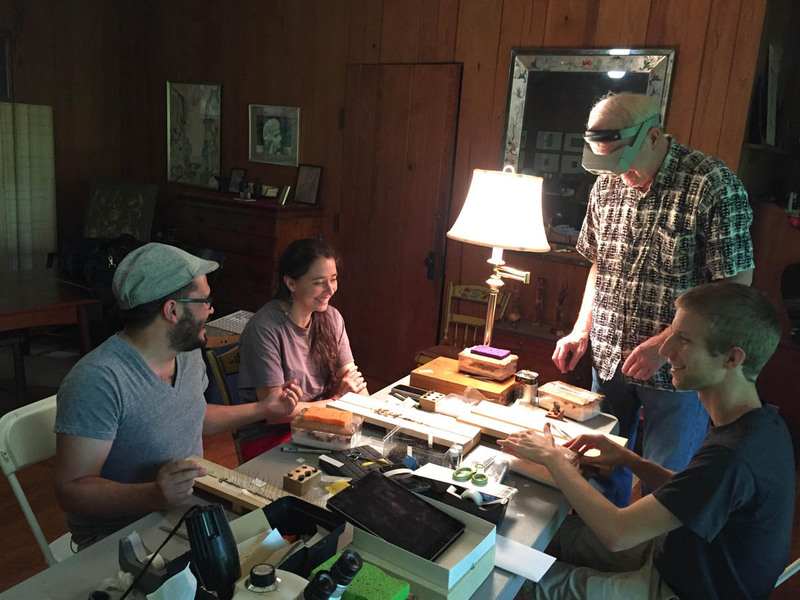 They immediately began their quest of all things beetles by collecting in the LES woods and various sites in the Chattahoochee N.F. JoVonn and Jordan left the LES at 4 pm to investigate a potential collecting site that features serpentine barrens. Unfortunately, it turned out to be a less than ideal collecting spot. At about the same time, two of the world's premier mecopterists, Wes Bicha and Takeyuki Nakamura, showed up at the LES! Jordan, who is very interested in scorpionflies, had invited them to join our expedition. 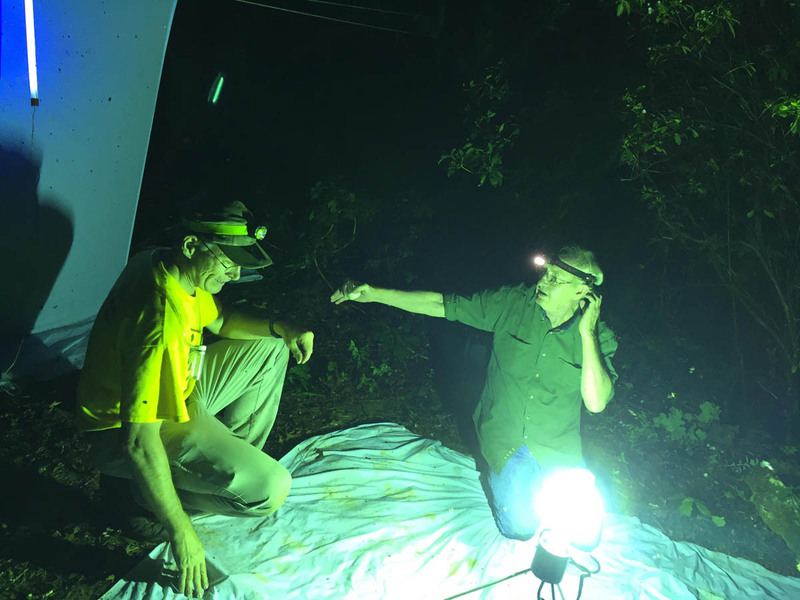 Meanwhile, Joe McHugh and Rick put up black light traps at the LES, including a novel trap design designed by Joe McHugh that combines a Lindgren funnel trap with a UV light. Richard and the moth gang also put out three sheets with UV lights in the woods bordering the buildings at the LES. With continued intermittent rainfall, blacklighting adventures were half hearted this evening. But, we all had plenty to do with pinning, sorting, and writing up logs. Of course, these trips are great for discussing taxonomy and collecting methods. 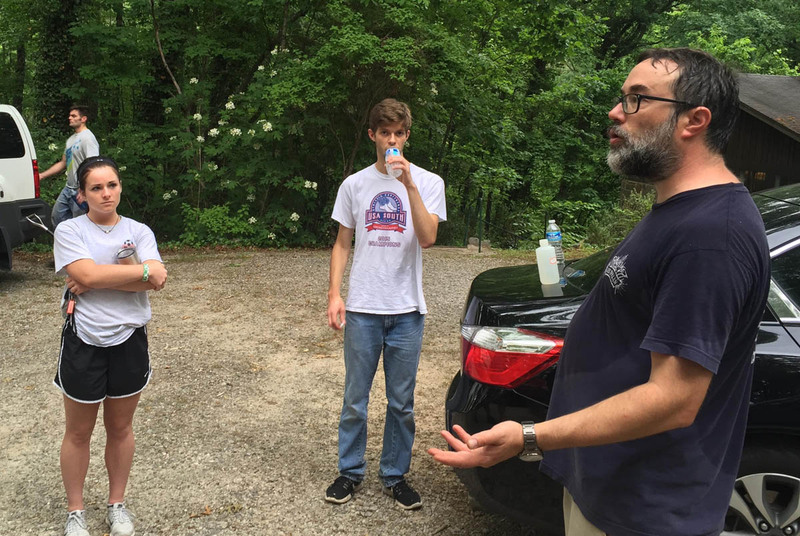 Terry, Ryan, Rick, and Joe (McHugh) combined their collective beetle powers for a collecting journey to a campground site called Sarah's Creek Campground in the Chattahoochee N.F. Apparently, it was a pretty good area, as that site was selected as the place to blacklight that evening. 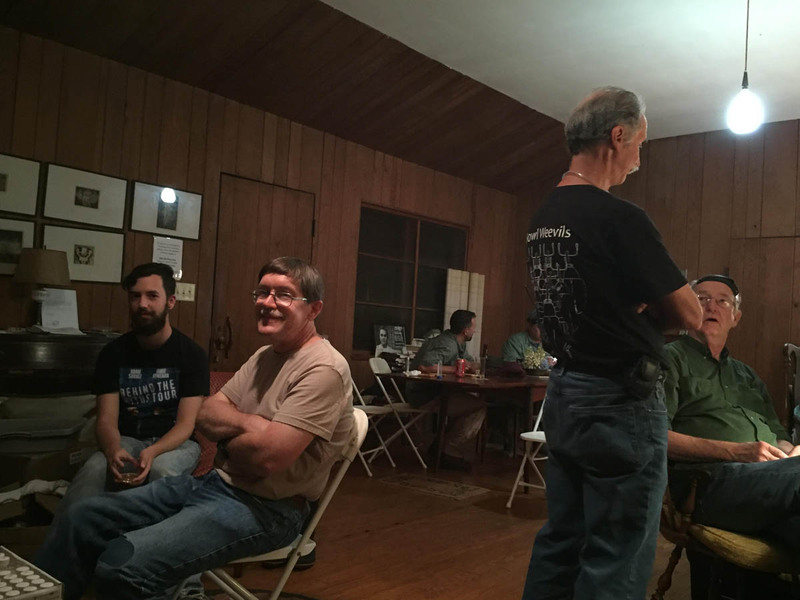 Following their general collecting at Sarah's Creek Campground, the dynamic quartet split up with Rick and Joe forming a two person beetle team and Ryan and Terry making up the other. Both parties continued their collections at various, and perhaps somewhat random sites, within the national forest. 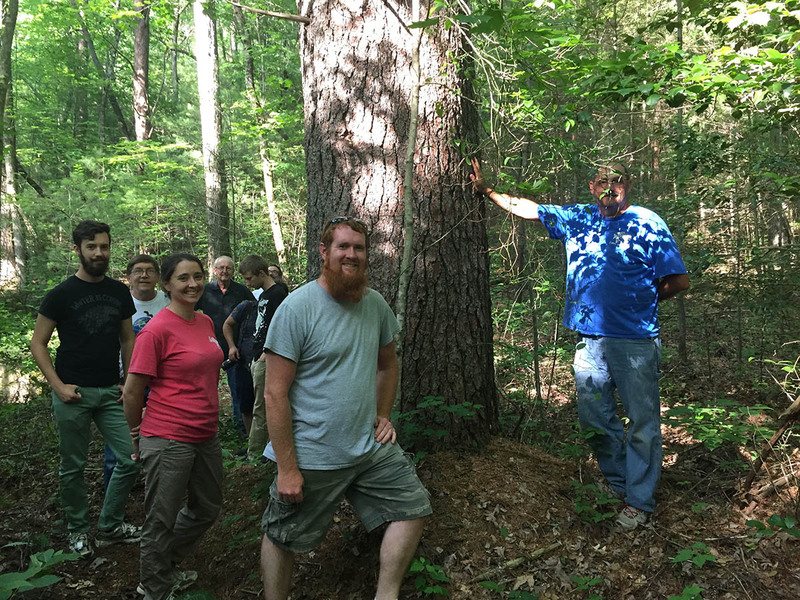 Terry and Ryan found a recently logged area, the the type of place where numerous beetle species might be found. Terry also made a quick grab of a Diana fritillary at another site. Wes, Takeyuki, and Jordan (the scorpionfly club), collected at a site that crossed the Appalachian Trail in search of an uncommonly collected mecopteran in the genus Brachypanorpa that had been collected there many years ago. Unfortunately, they did not find the rare panorpid, but did come back with other species in the group. These fellows also collected at the LES that day. Later that afternoon, Wes and Takeyuki said their farewells, and departed. 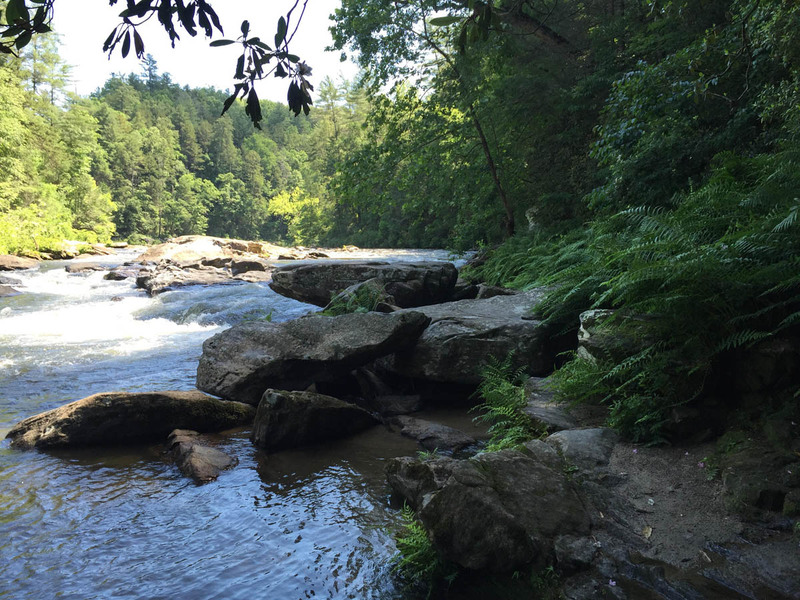 I made a trip to the forested site along the gorgeous Chattooga River where some of crew collected earlier in the week. After collecting at the South Carolina side of the river for a little while, I took a few minutes to soak in the beauty of this river. Following my visit to the river site, I spent the afternoon collecting at the LES forests, especially along the upper trail. 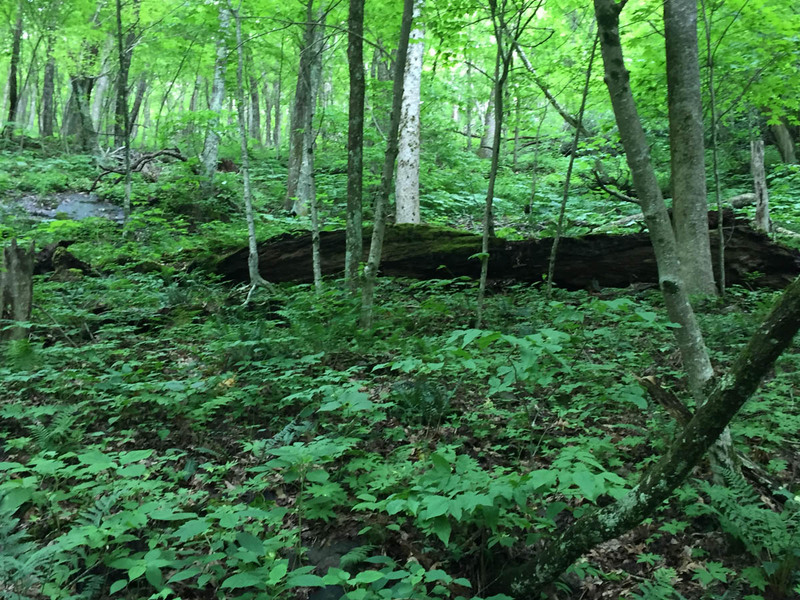 This hardwood forest habitat was perfect for finding Aphaenogaster picea and Camponotus americanus colonies. For the evening blacklighting adventures, Richard, Terry, Margarita, Luis, Ryan, Kyhl, Rick, and Joe McHugh spent the evening at Sarah's Creek Campground in the Warwoman Wildlife Management Area in the national forest. Jordan, JoVonn, and I stayed at the LES to collect at the sheets there. Things were popping at our sheets. However, the collecting at the WMA was apparently less than great. So, upon their return to the LES, the rest of the group collected at the sheets there. On this Wednesday morn, the moths folks were poised to spend much of their day spreading the wings of the many moths they had collected during the trip thus far. Joe McHugh and Rick were up for more collecting, although I don't know exactly where they went. This was to be their last day with us, as they were heading back to the University of Georgia later in the afternoon. Terry opted to stay at the LES and collect today, and he spent part of the afternoon taking down the three Malaise traps and three Lindgren funnel traps. Mincy Moffett and Anna Yellin, Georgia DNR staff members, stopped by to show Jordan, JoVonn, Ryan, and me some unique habitats in the Chattahoochee National Forest. As we followed them in our museum truck, we began to wonder where in the heck Mincy was leading us as each successive road became less and less of a road and lead farther and farther into the wilderness. We finally arrived at the end of one such road that was near an ancient cemetery (the Hicks Family Cemetery) with graves over 200 years old. The cemetery and woods surrounding the cemetery were interesting, but the primary point of interest here was a mountain top bog called Hedden Bog. We spent a couple of hours collecting at the bog and in the nearby forests, depending on the particular insects each of us was searching for. Anna, who is not a biologist by training, nor a field person, was super happy to be out and offered to aid in the collecting. As she was conducting random sweep samples in and at the edge of the bog, she collected numerous insects, including Dolichoderus plagiatus, a very cool species of ants that we only rarely encounter! After collecting in the bog area, Mincy, who serves as the botanist for the Georgia DNR, lead us to a beautiful mountain top glade site called appropriately, Glade Mountain. Mincy had never actually been to Glade Mountain before, but he knew more or less where it was on a map and we had compasses and GPS units with us. We started out on what might have been a logging road 30 years ago, but we soon lost that and were bushwhacking through densely wooded forests and rocky terrain. I don't know how far we walked, but it was probably a couple of miles; maybe less. 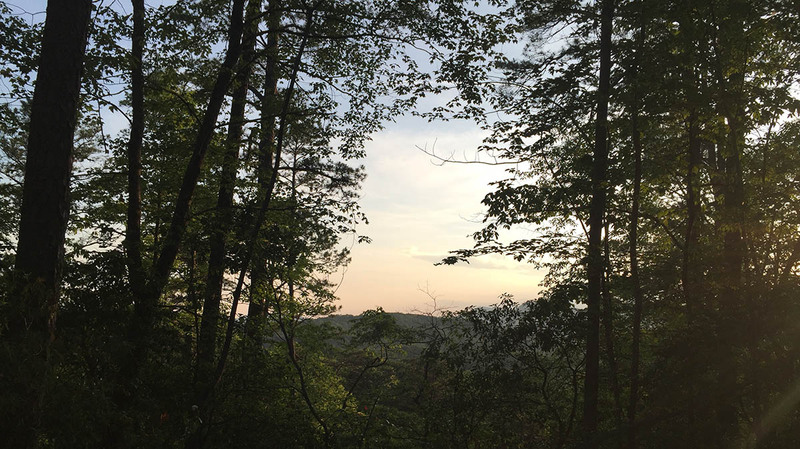 The hike was very scenic, albeit, taxing as we crossed creeks, climbed over and under fallen trees, climbed rock outcrops, traveled through valleys of ferns, and wandered through beautiful hardwood mountain forests. 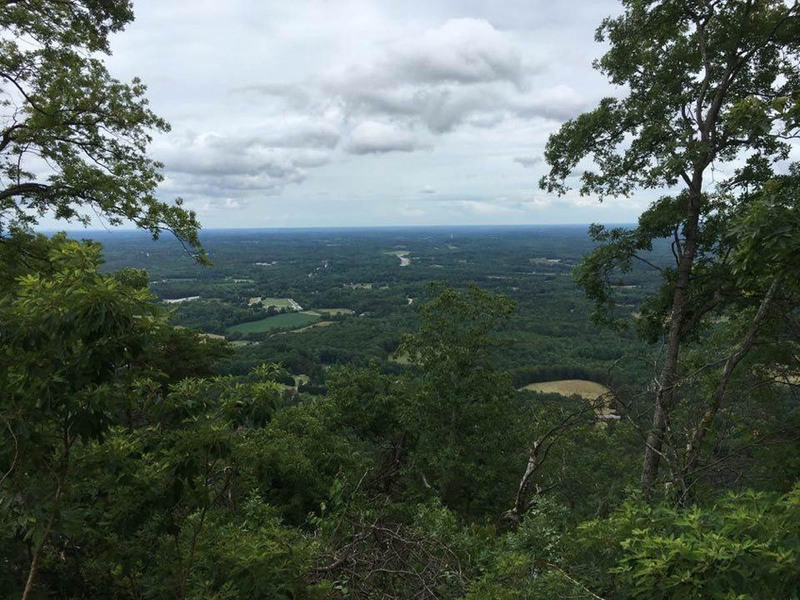 However, it was hot and humid, we had not eaten much, and as the elevation increased and the footing became more rocky, folks were feeling the exertion. Coupled with the fact that we were not certain where we were headed, this was turning into quite the adventure. Eventually, we came to the base of a mountain and could see what looked like openings higher up. 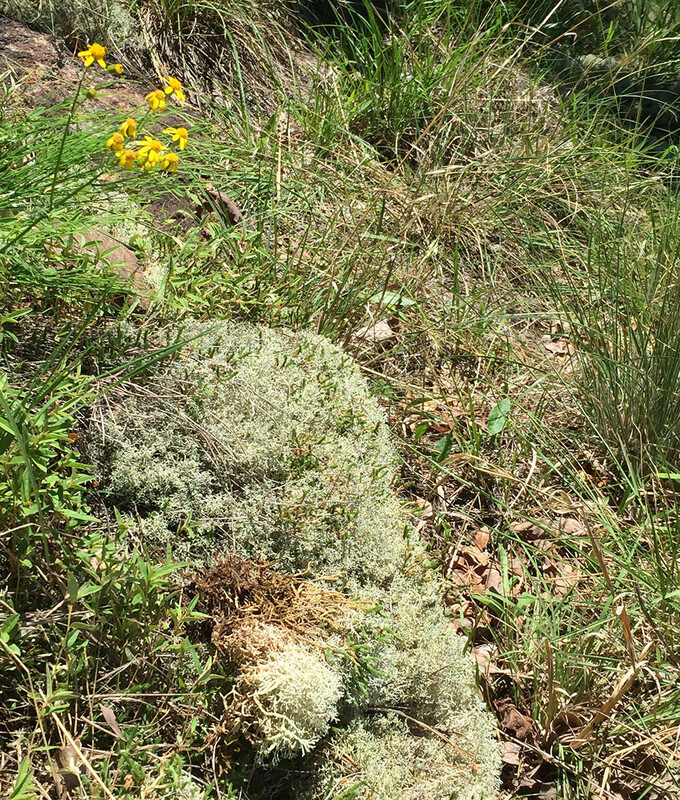 We began climbing and scrambling up a fairly steep mountain hoping to find glade-like habitat. As we climbed further we were rewarded with rare rhododendrons that only grow in this area, beautiful primitive ferns, random grass tufts growing from between and on rocks sometimes forming mats, and lichen encrusted rocky slopes. With our nets, pans, backpacks, and other collecting supplies, climbing was difficult, if not treacherous. The granite-like rock surface was relatively easy to grab, and we were also aided in our assent by the numerous holes in the rock that were perfect for inserting fingers. Depending on the route that one chose to scale the mountain, the climb was medium difficult to difficult, but manageable for most folks, but it was steep and wet in places. JoVonn, Ryan, and I were the only ones who made it to the top. The others made their way up to various levels. While there, we spent time collecting ants and various other insects while trying not to fall! This was harder than one might think. After collecting for about one hour, we began our downward trek, which at times was done by scooting down wet moss covered rocks on our backsides. Finally, we all made it to the base of Glade Mountain, and we began our journey back to trucks. We did not go back the same way we came in, but we eventually found a more direct route, which was obviously an old road. Wow! Quite the adventure, but well worth it. We said goodbye to our DNR friends and headed to the next site. On the way back to the LES, we stopped at Sarah's Creek Campground for some day collecting. It was very busy today with lots of campers, several of whom asked what we were doing. They mentioned that the trout were easy to catch. We hung around for a while sweeping and beating vegetation, and doing other general collecting. Finally, hungry and on the tired side, we headed back to the LES. When we returned, Terry had finished his take-down of traps, and was getting ready to meet his wife who was vacationing nearby, before heading back to Starkville. Meanwhile, the rest of us, sans Rick and Joe McHugh, who left earlier, scrapped down some very tasty pizza before some leisurely blacklighting at the center. Later in the evening, we packed up our makeshift lab in preparation of an early morning departure from the LES back to Starkville. Departure! We loaded the three trucks and set out for Starkville. Another Cross Expedition in the books! Next stage will be processing and labeling, then eventual identification! Species lists will be added here when complete.